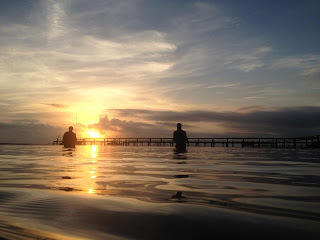 to their comfort zone, deep water where the temps change slowly not over night. But we have a lot of fish that like the coolerwater, Blues, Mac’s and Pompano to name a few, maybe the cooler temps are not that bad after all. Surf anglers like this west wind it will push the wave down make it more favorable for just being on the beach. I will say fish early for numbers be it Blue Fish or Mac’s, cut bait has has been preferred it seems the sent has been the key,normally I would say spoons but the cut baits have been on top this week, use a smaller hook to put the Mac’s up on the beach. Whiting are there for the lunch time angler, the water will warm the Blues will back off and I come the big Whiting.These fish like the warm water,they are a pitch away, if you cast you will be beyond them but not to worry the Jacks are there all day. Pompano have just been a hard find, no pattern if they are there, cooler temps will bring them in.In the river the Trout are deep and the Reds are shallow how easy is that. Red fish like the cooler water they can be foundagainst the east shore line in the mangroves or to the west hanging around the pilings of those long docks, one thing that has keptanglers busy has been the live bait, shrimp has out fished the artificial. a few here and a few there but still not enough to say they are back. This is one of the species that like the cooler water and temps and these cold days will bring them in, ugh. With the windy weather over the weekend not many people got out. 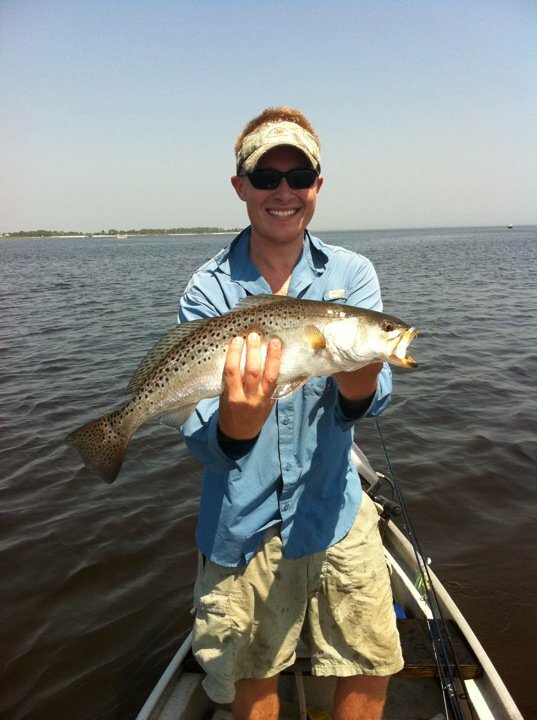 The trout fishing was ok to the south around the power lines with some redfish mixed in. 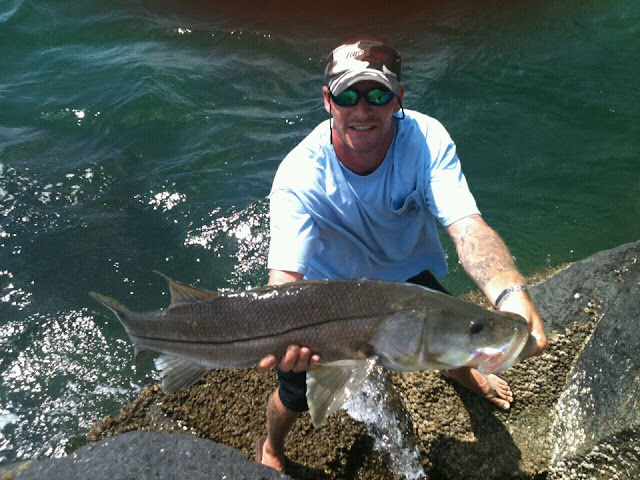 The snook fishing was good around the bridges and in in the inlet on the outgoing tide. The south jetty has had some bluefish,flounder and a few snook. Hopefully the weather will get better later in the week. The trout bite is still on but they have been on the smaller size. Fish the tips of the spoil islands on live shrimp and/or a D.O.A shad or jerk bait. The snapper andgrouper have been coming over the rails, fish the channel edges and docks using shrimp or squid. The pompano bite has been outstanding, fish the inlet flats and the Wabasso area. Use Doc's goofy jigs and tip the same with clam or shrimp. You will find the sheepshead and tripletail around the channel markers, use live shrimp. If you are targeting flounder, fish the flats, spoil islands and docks. Tarpon, redfish, pompano, spanish mackerel, blues, blackdrum and flounder. For best results fishing for tarpon, fish on a outgoing tide and use bucktails. 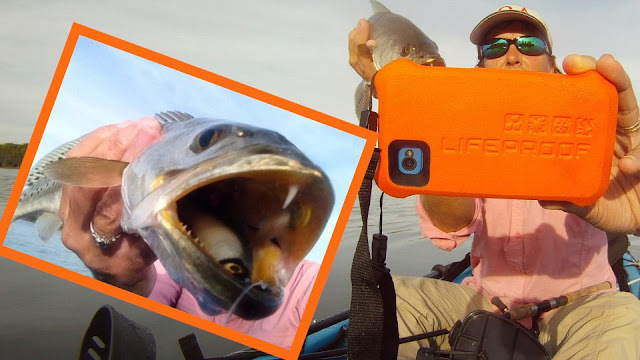 Redfish are biting on live bait and bucktails. Pompano are hitting on clams, shrimp and doc's goofy jigs. The mackerel and blues are hitting spoons and theflounder are hitting on live shrimp, mud minnow or mullet. What a beautiful morning at the Sebastian Inlet! Winds are blowing out of the East-Northeast at 4 mph, there is a light chop on the water and the sun is shining. It just doesn't get much better than that! Today would be a great day to get out and wet a line. 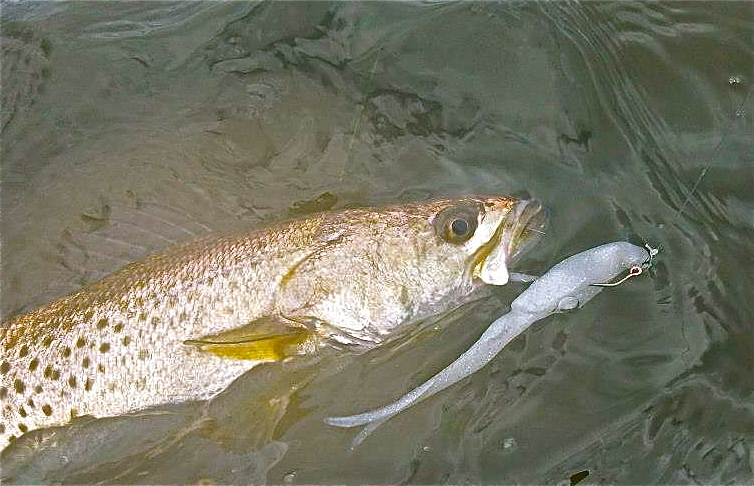 Tommy Turowski of the Sebastian Inlet Bait and Tackle Shop reported that a fair bite was going on yesterday. Nice sized Blues, oversized and slot Reds, good sized Sheepshead, Pompano and Black Drum are all making appearances. Our first photo today features 8 year old Matthew Kyong with an enormous 65 lb., 45" Black Drum! 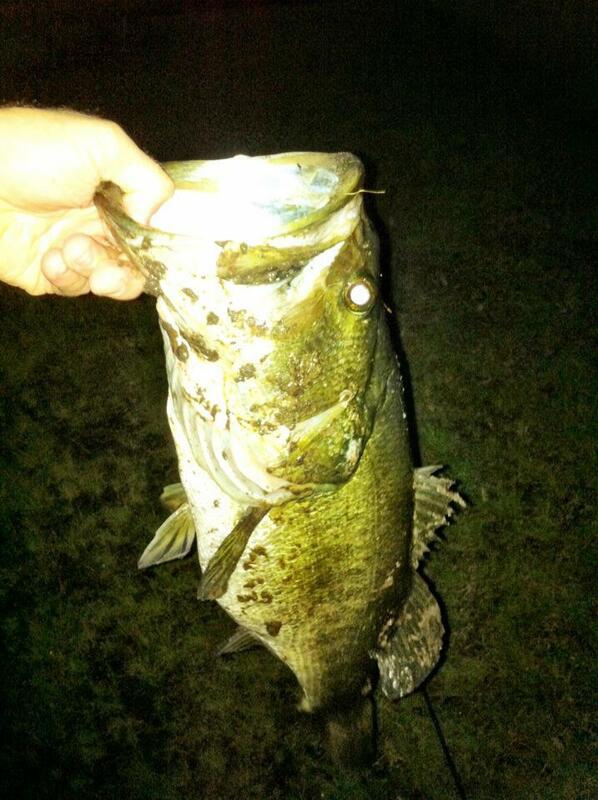 Matthew was fishing Thursday morning with his dad and a friend when he hooked up with this monster around 3:00 a.m.! Matthew fought the big Drum for about 20 minutes before landing it. Photo two features Ron Ciasullo of Waterbury, CT who winters in Coconut Creek. Rich reported a very good Blues bite off the south beach. Ed didn't know the name of the gentleman in our third photo, but he knows him as "Mr. Rooms to Go". Mr. Rooms to Go landed this gorgeous Sheepshead off the south catwalk on Monday. Our last photo today features Elvis Purnell with a big C/R Redfish. This past week gave us a few different weather patterns to cope with, but most days were flat calm and warm. 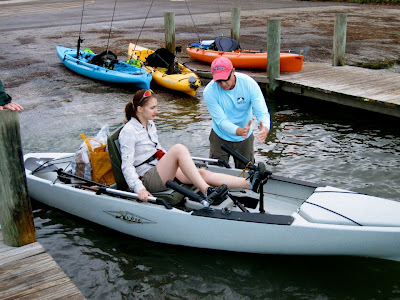 It was super to be on the water in such mild weather. We did have a short cold front move through the area, but it didn't stay long and the sun warmed things up quickly. It has been a nice week and we enjoyed the sunshine and fishing! Trout have been hanging on the edges of the flats and sand bars in three to five feet of water. DOA shrimp is a great choice of lures for trout in winter. Our redfish have been hanging under the docks recently along the sheepshead and black drum. 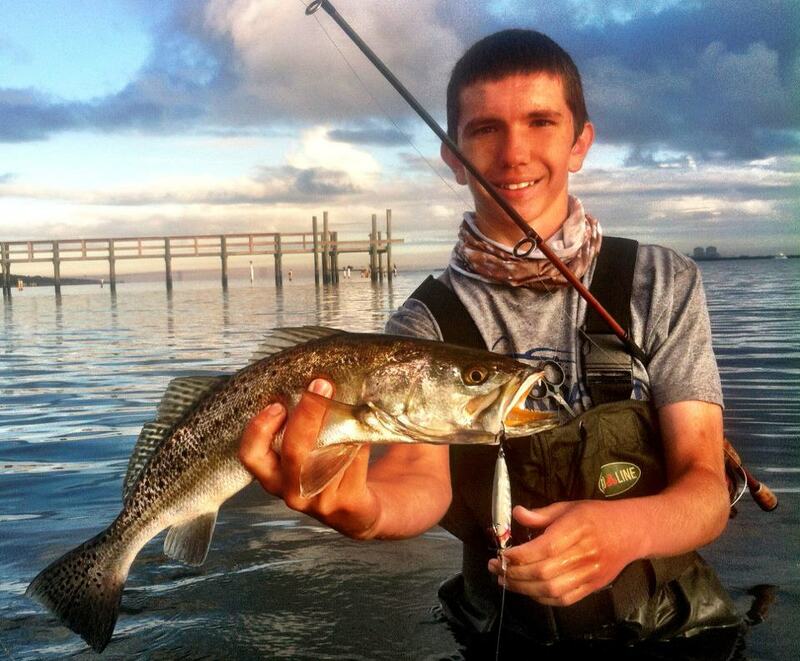 Ladyfish and jacks are everywhere and will keep the kids occupied and smiling. There has been a good sand perch bite around the bridges and the mouth of the inlet has been flooded with jacks, mackerel and bluefish this past week. Have fun and enjoy the fishing! It's a chilly morning at the inlet! Winds are blowing out of the Northwest at 7 mph and there is a moderate chop on the water. We have a crisp, sunny day ahead of us, it should be a great day to get out and do some fishing! From some of the updates we've gotten from our readers, it seems that Christmas Eve and Christmas Day were good days for Blues, Sheepshead and Black Drum. A report from SISP Ranger Ed Perry said yesterday was pretty blown out, making fishing difficult. Ed fished Christmas Eve and Christmas Day and reported the Flounder that were landed were paper thin and without roe, meaning that the fish that moved out after Hurricane Sandy were coming back in, spawned out. A few fatties were still on their way out. Our first photo today features Cora Cruz of Orlando with a Black Drum she landed using live shrimp. Chris Gladney of Poinciana is featured in our second photo today. Chris landed his 24" Black Drum using dead shrimp. Snook are like most true Floridians…they hate the cold!!! But, they still have to eat, a few things we do to catch them when the mercury dips down. It's a little overcast and a little windy this morning at the inlet. Winds are blowing out of the South-Southwest at 14 mph and gusting to 19. There is a moderate chop on the water and a small craft advisory is in effect through late tonight. Tommy Turowski at the Sebastian Inlet Bait and Tackle Shop reported a pretty good variety of fish were caught over the weekend and through Christmas Day. Blues, Pompano, Reds, Sea Trout, Flounder and Sheepshead all made appearances since our last fishing update. Thanks Tommy! Mike Ricciardi of Vero Beach tried fishing the north jetty, He had a bunch of sand fleas and went out to fish for Pompano friday, but the waves and currents were so bad, fishing was close to impossible. That, and the fact that it was so cold, his fingers were numb, made the decision to leave after one hour an easy one! From 6:30 a.m. to 7:30 a.m., a few oversized Reds were landed on the inlet side by a couple of men using plugs. Our angler of the day is Brad Farless of Vero Beach with two nice Sheepshead he landed off the south jetty. 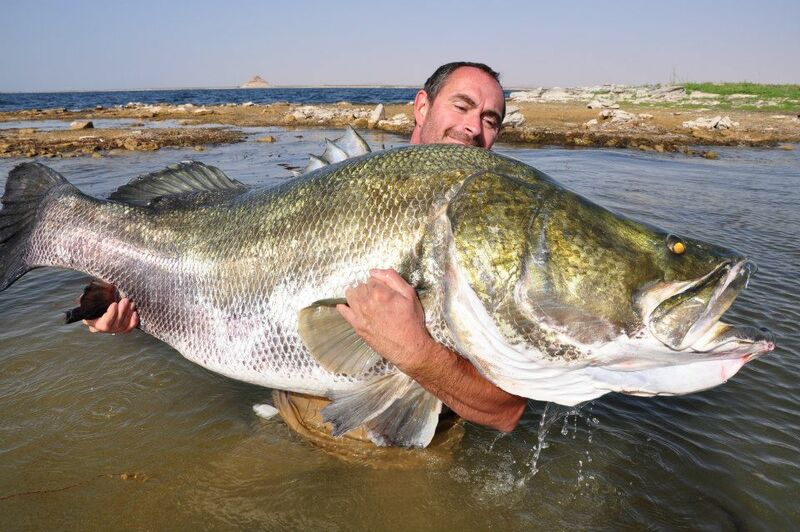 How about a Holiday Guided Fishing Trip..... A few of my friends you may want to check out. ALL Lure Kits are 50% OFF Through Christmas!!! 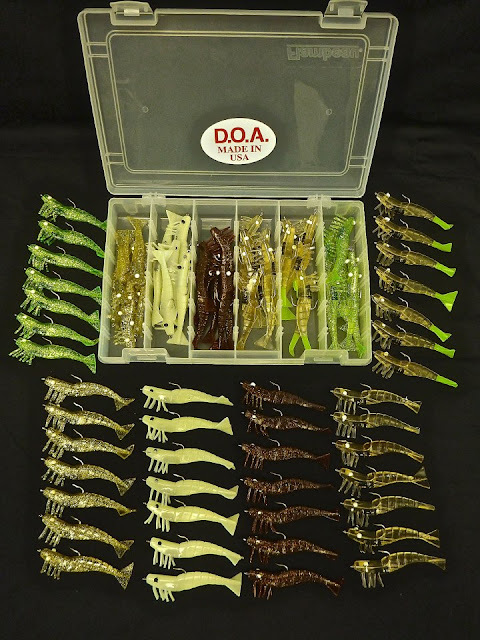 That means our 42 piece 3" shrimp kit is only $21.95. You cannot get 42 rigged shrimp with a box for cheaper than that! So, you want to customize it with your favorite colors? No problem! A whopping $2.00 will get your kit completely color customized. Great gift for the fisherman in your family...or for yourself. Call or order online today! How do you get $115.00 worth of Bait Busters for $25.99? Check out our 24 piece Bait Buster Kit now on sale til Chrismas. Any fish that eats other fish will eat a Bait Buster, so grab a kit for the fisherman in your family...or give yourself one. Want to get one shipped out of the USA? 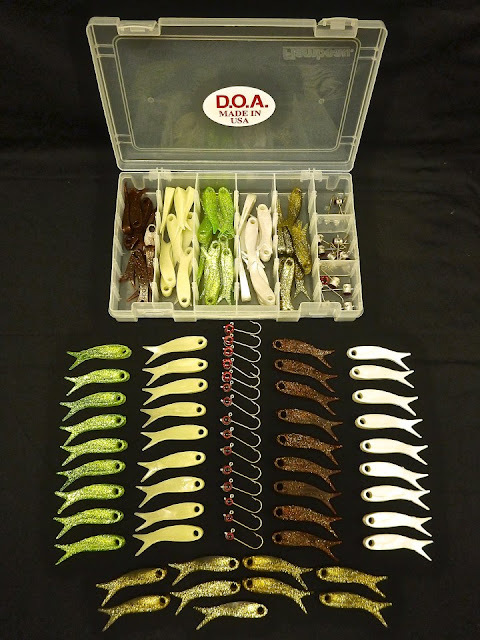 Email(craig@doalures.com) or call us at 1-877-362-5873 and we can get a shipping cost calculated for you. Inshore the trout fishing was good with some nice fish to the north of north bridge with some reds mixed in. The South jetty had some nice flounder and pompano yesterday on the outgoing tide. Good Luck! 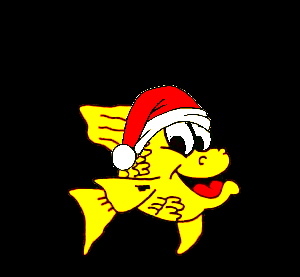 Merry Christmas From Everyone at Whites Tackle! Reports of nice size reds on the flats and the trout bite has been outstanding around the spoil islands. Most anglers have been having much better luck fishing the tips of each of the spoil islands. Mangrove snapper and sheepshead have been the bite around the docks this past week. Use frozen or live shrimp. 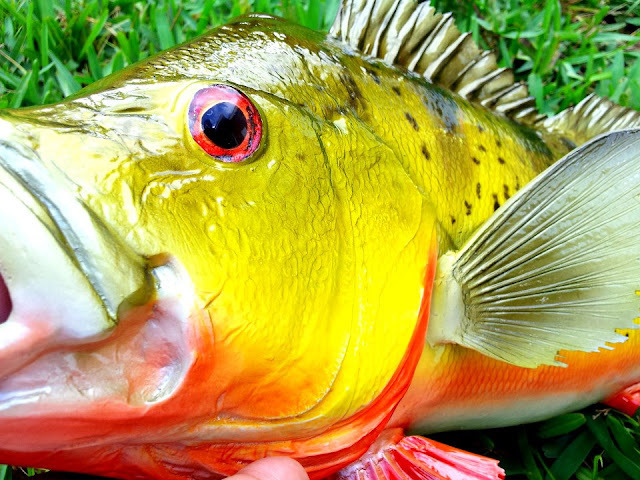 Received reports yesterday that there is a good number of tripletail around the channel markers and along with the tripletail, anglers are getting plenty of bites from thesheepshead as well. The pompano bite at Wabasso has slowed but some anglers are having luck with a few nice size pompano. A lot of reports of anglers catching lady fish and lizard fish as well. Most anglers have been having fun bringing up black drum, sheepshead, blues, jacks, flounder, pompano, reds and spanish mackerel at the inlet this past week. When fishing for the black drum, most anglers have been using cut bait or live shrimp. The flounder have been biting the best on mud minnows or finger mullet on incoming tide. When targeting the mackerel, use a silver spoon and the bluesand jacks have been hitting on almost anything you throw at them. Blues, pompano, tarpon, whiting and some snook mixed in. We have cool, Northwest winds blowing at 17 mph, gusting to 23 and an occasional gale force gust. There is a moderate chop on the water and there is a small craft advisory in effect through Saturday night, which may continue through the weekend. Always check the coastal forecast prior to venturing offshore. Vero Beach resident Mike Ricciardi fished the north jetty yesterday morning and reported the bite slowed down quite a bit, and could have been because crabs were everywhere stealing bait! As soon as the bait hit the bottom, they would sneak up and they couldn't be felt taking the bait, but sure enough, they did! Mike reported that early in the morning 4 Pompano were landed, he landed two at 13" and 16" and one Sheepshead was landed by another angler. After 8:00 a.m., things got very slow. Larry Olmsted of Vero Beach reported that he fished the catwalk for Flounder, but only saw about 8 of the flatties landed all day. Larry thinks some cold weather would help. We'll find out over the next couple of days! Our first four photos were sent in by SISP Ranger Ed Perry who spent two weeks of vacation fishing the Sebastian Inlet. While Ed was at the fish cleaning table, he saw Andre Delgado land the 7 lb. Tripletail off the T-Dock, in our first photo today. Photo two is of A.J., who hooked up with a Jack Crevalle that was about 10 lbs. 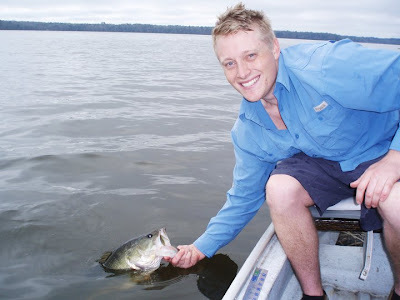 Using a small rod and live finger mullet, A.J. was quite a trooper and played the fish well using drag, etc. This big Jack put up quite a fight, but A.J. prevailed in the end. What a gorgeous day at the inlet! Winds are blowing out of the South at 6 mph and there is a light chop on the water. Those conditions are forecasted to change with the coming "cold" front. There is a small craft advisory from late tonight through late Saturday night. Always check the coastal forecast prior to venturing offshore. We received an update from Brooke Ashley with the Sebastian Inlet Bait and Tackle Shop that yesterday the Pompano bite was very good. Sand fleas, clams, dead and live shrimp were the baits of choice. Black Drum were hitting as well and Flounder were being caught from the rocks near the Tide Pool. First Photo features Diane Buyce of Melbourne with a 14.5" Pompano she landed using sand fleas on Tuesday. Our last photo today is courtesy of SISP Ranger Ed Perry. We've been hearing about the birds that have been "out of place" lately, now we have fish that are out of place. The Hickory Shad in last photo was caught in a cast net by Rodney Walker. Neither Rodney nor Ed has ever seen one at the inlet. They are normally found from Maine to Northeast Florida. Like the American Shad, they leave saltwater for fresh water to spawn. Hope everyone enjoys the Holiday Season! It's been a wonderful year of seeing old friends and making new ones on the water. I guess somebody forgot to tell mother nature that it's the dry season on the Treasure Coast. We have had quite a bit of rain around the area, and we have been caught in it a couple days recently. We can always use the rain, but it could come at more convenient times... Water temperatures remain mild for this time of year and you can find lower to mid 70 temps on the river this week. It has the fish out feeding on the flats instead of sitting in a sand hole by the furnace. Sheepshead are thick around the docks right now. Most days we only have to hit one or two docks to find enough for dinner. They are good sized fish, too. You can also find a few redfish hanging under the docks this time of year. Trout are out on the flats in three to five feet of water and willing to take a well presented DOA shrimp or the Deadly Combo. 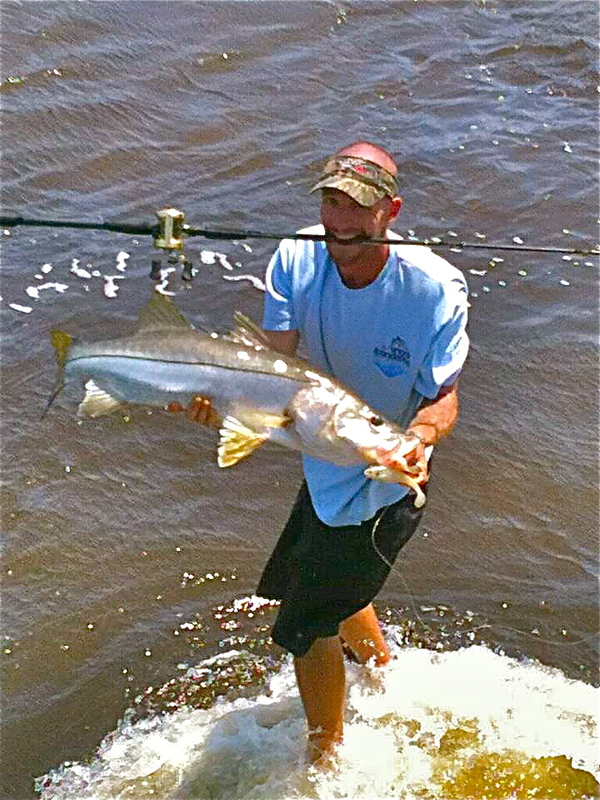 There are plenty of the usual jacks and ladyfish around the river to keep the young ones busy and smiling. We have found some short snook and slot redfish around the mangroves. 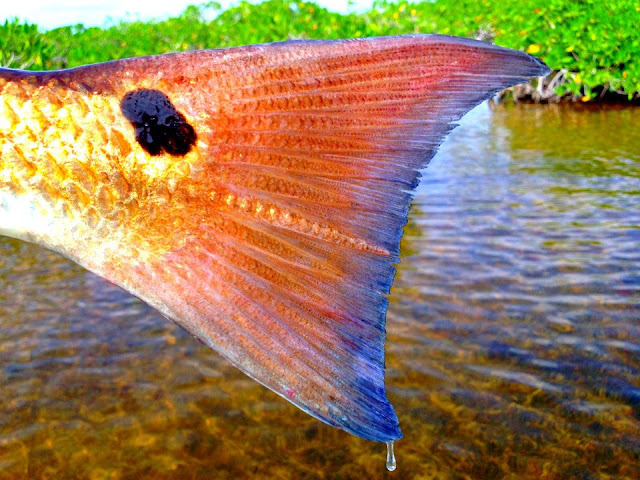 I like to use a CAL paddle tail in rootbeer color around the mangroves for redfish. You can find pompano scattered up and down the surf this time of year with the usual whiting. Bluefish are moving in now, so expect to catch your share of these toothy critters. Black drum have been around the bridges and docks of the river. We caught lots of small snapper on the flats this week. 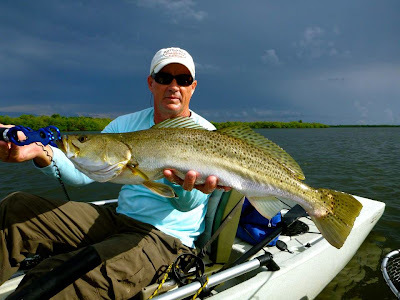 Spanish macks are hanging around the inlet and turning basin with the jacks, ladyfish and bluefish. It's a good mix of fish this week. It will continue to be windy most days and cooler temperatures will be coming soon. Dress in layers when you head out and I guess the way the weather has been...keep a rain jacket handy, too. It has been very foggy, so be careful both trailering to the ramp and when out on the water. Have fun and be safe! It's a beautiful morning at the inlet. Winds are blowing out of the Northeast at 7 mph and there is a light chop on the water. Yesterday morning was slow on the north jetty. A couple of smaller Black Drum came over the rails, along with a few Blues and Pompano. The afternoon picked up according to Diane Buyce of Melbourne. Diane landed two Pompano and one Whiting in the morning hours, but ended up catching her limit of 5, using sand fleas later in the day. The highlight of Diane's day was while she was at the cleaning table, a Pelican with hooks and wire stuck in it, came begging and she was able to free it of lines and hooks. She treated the pelican to a couple of Pompano heads for being patient with her as she worked on him! Way to go Diane, Santa should be extra good to you this year. Mike Ricciardi of Vero Beach landed 4 good sized Pompano using clams.